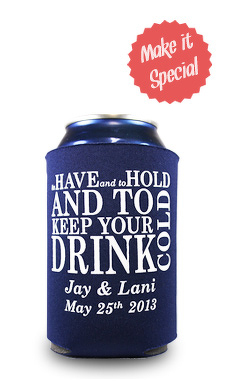 "To have and to hold and to keep your beer cold"
With the names and date below the design this wedding koozie couldn't be simpler - we just need the names of the bride and groom that will be "having and holding" and the date of the wedding. Our To Have And To Hold Koozie is made of high quality 1/8" thick high density foam that folds flat for easy transport and can travel anywhere. Our To Have And To Hold Koozies will not only be a hit with the guests, but will be the wedding present that keeps on giving the gift of cold beer throughout the year. Please enter the names and date in the comments section during checkout and we will send you a mockup of what it will look like for you to approve before we go to production. Thank you so much for your great communication and very fast service. The koozies were exactly as described. Thank you so much!!! We will definitely order again!! I love ordering from this company. I always have wonderful help with everything. Tlyer was awesome. He took really good care of me every step of the way. My order was short notice and he made everything perfect. And it got to me by my deadline. Thanks so much for all you do for your customers. It shows in everything you guys do. These came out so much better than I ever could have imagined! I've already started using one for myself and the wedding is still 6 weeks away. I cannot wait to hand these out to the wedding guests! They're simply perfect and will match the occasion perfectly. Product was wonderful and the service was even better. They made sure to ship it to me in plenty of time for my wedding and called to make sure I previewed the product to my liking in enough time to have it shipped prior to my big day. Wedding coolies exceeded my expectations! We ordered these for our wedding favors, and they turned out perfect! Ordering was super easy, and they shipped quickly. We're very pleased with the item and the purchasing experience! Very pleased with everything. The order arrived ahead of schedule, great job on the coozies. Thank you some much. They turned out even better than I had anticipated. I'd like to thank Tyler Bearman for his guidance. Excellent, excellent service! And, I'm very happy with the product! The bride & groom are going to LOVE their wedding favors (they haven't seen them yet cause they live out of state). I would highly recommend Wedding Coolies.com to anyone looking for wedding, party and/or charity events. Thank you so much for the super fast delivery and awesome service. We love our coozies! Excellent customer service & great product! My fiance & I were very pleased with the Koozies we got for our upcoming destination wedding. I would absolutely recommend Wedding Coolies.com to others! I am very pleased with the koozies I ordered for a his/hers shower favor. I wish I had an option to buy fewer than 50 (only needed 30), but the bride thinks she may be able to distribute the leftovers. Another company offered complimentary bride and groom koozies with any wedding-related purchase, which I would have loved. However, that company had a frustrating website and cheaper product. This site was easy to use, and the service was fantastic. Bottom line: everyone loved the gift! The wedding can coolies that we ordered for my daughter's wedding were exactly as we ordered! We even made changes to the proof. The ordering process and communication back and forth was timely and easy. The can coolies are so cute and will be such a nice addition to our daughter's wedding. Thank you so much! LOVED the coolies. Everyone thought they were fantastic! We were so pleased with the final product! I liked being able to do the "live chat" and ask questions about the koozies, and then was so impressed that I was just able to tell you what I wanted the graphics and text to look like and you did exactly as I asked! Ordering was so easy, and the delivery was prompt. Thank you!! They look awesome! I would reccomend this site to anyone! Thanks again for helping make our big day perfect! The wedding coolies we ordered were great. The service was wonderful and they got to us quickly and we love them. Recommend this company highly. Five stars!!! After ordering from another sight and having cheap ones sent out- these were far better in quality and printed perfectly! We couldn't be happier with the service and product. Communication was handled professionally and promptly. The product shipped in a timely manner and looked fantastic. Worth every penny!! Thank you!! Our koozies look great! The team at Wedding Coolies emailed us the next day to approve our design and they were delivered a 2 weeks later. Great customer service. Awesome koozies! Fast shipping and very helpful throughout the process. Recommend to anyone. Came out exactly the way I asked. The art process was very easy and the staff was helpful and quick in designing exactly what we wanted. The koozies were received very soon as well. Overall, I had a great and easy experience. Absolutely would recommend these to any future brides and grooms. They are exactly what I was looking for and came out just how I wanted them to! They were a HUGE hit at the engagement party!!! I recently ordered Koozie's as favors for my up-coming wedding. The ordering process was super easy, and within 3 days, I had approved the proof and they were sent to production. The quality is great, and they turned out better than I expected. I would recommend them to anyone looking for something fun for a wedding or any other event! They were just what I asked for. The customer service was great and very easy to deal with. Thank you for your service! We ordered the coolies for our new years eve wedding & we loved them! We have ordered coolies from other places for our halloween parties that we have, but we liked the saying on these. Very nice. Thank you. I just wanted to say "Thank you" for the excellent communication throughout the transaction and the amazing quality of your coolies! They were a surprise for my daughter's wedding, and they loved them! LOVED the finished product. I ordered black and white and just did the city of the wedding with the wedding date instead of our names. Fast delivery and easy processing of order once PDF image was approved by me. Wedding Coolies was an awesome company to work with. Not only were they very responsive and pleasant to talk to, but the koozies we ordered came out perfect! We will definitely order from Wedding Coolies again!